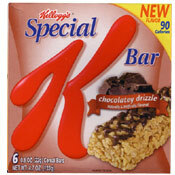 I tried two of the new flavors of Special K Bars - this one and Peaches & Berries. The Peaches & Berries was my favorite. The Chocolatey Drizzle bar is good. My only complaint is that the actual chocolate drizzle tastes slightly artificial - like a chocolate flavored vitamin. But other than that, it tastes and feels like a rice krispies square made with Special K.
What do you think of Chocolatey Drizzle Special K Bar? These are so good and satisfying but the chocolatey pretzel bars are even better! Tasty quick snack :d mmm I just ate one, they're pretty tasty. Tried the chocolatey drizzle for the first time and didn't care for it much. I wouldn't buy it again. I can eat a double chocolate rice crispy treat for 100 calories and really feel like I'm really eating something good. These are quite nice, friends. 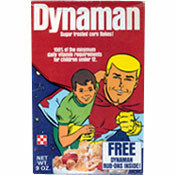 I normally don't like things like granola bars, or rice crispies, but this is one I actually like! These are the best thing I've ever eaten. This is great tasting and delicious!! !